Police say one person was arrested during the protest. Protesters gathered outside a Center City hotel where Vice President Mike Pence spoke Tuesday. The crowd protested the separation of immigrant families at the U.S.-Mexico border. 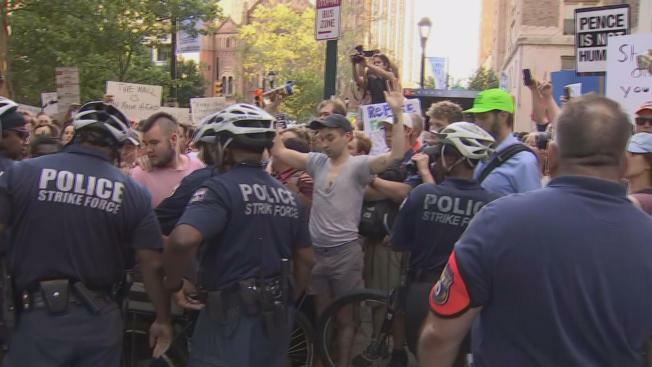 Hundreds of protesters gathered outside Philadelphia's Rittenhouse Hotel as Vice President Mike Pence spoke amid national outrage over the separation of migrant children from their parents along the U.S.-Mexico border. Pence touched down in Philadelphia early Tuesday evening to attend a fundraiser at the Rittenhouse Hotel with Scott Wagner, the Republican nominee for governor in Pennsylvania. Outside the event, hundreds of protesters descended on Center City during the Stop Separating Families rally to oppose President Donald Trump’s immigration policy. Several laid out children's shoes in solidarity with the families being torn apart at the border. The crowd chanted "City of brotherly love says no," and "Say it loud, say it clear, immigrants are welcome here" during the protest. One woman also walked through the crowd for at least an hour with a speaker playing the sounds of a baby crying. Tensions began to rise later during the protest when a federal security detail car tried to move down Walnut Street. Some of the protesters blocked the car and police stepped in, leading to a confrontation, officials said. The crowd chanted, "Our streets" for about 15 minutes until police were able to move them. Police say one person was arrested during the incident. An unapologetic Trump doubled down on his policy earlier in the day, declaring that the U.S. "will not be a migrant camp" on his watch. But images of sobbing children held in fenced cages fueled a growing chorus of condemnation from both political parties and even four former first ladies. The children are being held separately from parents who are being prosecuted under the administration's "zero-tolerance" policy for illegal border crossings. Pennsylvania Attorney General Josh Shapiro joined other attorneys general throughout the country in signing a letter opposing the practice. Delaware Gov. John Carney also denied a request to send National Troop guards down to the border. In a series of tweets Tuesday, the Democratic governor said he "can't in good conscience send Delawareans to help" given a Trump administration policy that has torn apart families seeking asylum when attempting to cross the border. Carney's announcement was followed up by similar sentiments from Pennsylvania Gov. Tom Wolf and New Jersey Gov. Phil Murphy, who signed an executive order in the afternoon banning state resources from being used to separate families of immigrants. Tuesday night's event benefits the Republican Governors Association, and Pence and Wagner both spoke. The association did not release details on how many people attended the private event or how much they paid to get in. Wagner is challenging the re-election bid by Democratic Gov. Tom Wolf, who began June with a nearly 10-to-1 cash advantage after Wagner spent heavily to win a three-way Republican primary last month. The fundraiser was closed to the public and media, but NBC10 covered the demonstration. Follow us for complete coverage.